The Blueberry Smoothie-tini - Let's just call this the anti-oxidant martini smoothie! 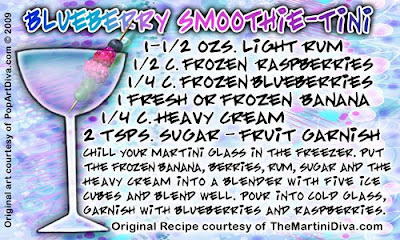 Rich in healthy flavors of blueberries, raspberries and bananas this is a health nut boozer's dream, lol. If there is such a thing as a health nut boozer - is there? To really make it healthier substitute plain yogurt for the cream and use honey instead of sugar - you'll never know the vodka's in there unless you have one too many! But you're not going to do that because you're healthy, right! Enjoy and Cheers to having a great weekend!